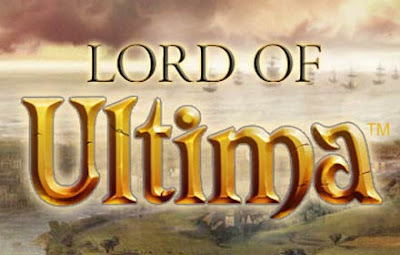 Lord of Ultima (LoU) is a slow-paced Real Time strategy game based in the world of Ultima (which is the only real tie-in to that game), where the objective is to build castles and conquer other players and/or conquer the world. It has a nice mix of PvP and PvE with a promised "end-game" patch slated to hit prior to end-of-year that will flesh out the game even more. As with most Browser-based games it is simple enough to be played from almost anywhere (work, home, hotel) on any computer without much trouble. The game is set in a quasi-medievel setting, with multiple different building and troop types. While the graphics are not going to need the current year's video cards to render, they do get the job done. This is a relatively simple game, so aside from the terrain there are only a handful of building types, dungeon types, boss mobs, etc. Each model is appropriate for it's purpose, and easy enough on the eyes, but don't expect to see intricately designed structures with ornately decorated textures, etc. Unlike standard MMO's I believe each Lord of Ultima game has a finite time-limit, although the game's length is measured in months and years instead of hours and days. When a new server is opened a new game begins, and once someone has completed a complex series of PvE objectives the game can be "won", at which point the server will probably be wiped and a new game will be started. I say "probably" because we don't really know, as the end-game objectives have not been implemented yet. Either way, there is enough depth that newer players will enjoy "starting over" a few times to use tips and tricks they learned the first time around. On a micro level the game is very repetitive forcing players to build cities over and over, but there is also enough variety that each city should have it's own purpose and, therefore, it's own design. The game is much "bigger" than just building a city and moving on...and for those that understand the long-term goals of the game things actually become more enjoyable the longer you play. Because of this game's accessibility (no money needed, playable from any browser, etc) it attracts a large number of people. More people almost always means more shenanigans (yes, I just used "shenanigans" in a sentence!) and immature behavior, and LoU is no exception. There are a lot of moronic conversations and there are also a lot of "new" players just trying the game out "because it's free", so it can be difficult to find a group of serious players that truly enjoy the game; they are out there, but they are sometimes overshadowed by other personalities. ...A minute to learn, a lifetime to master....well, maybe not quite like that, but the game at face value is very simple. You start off with a single city and a decent tutorial to show you what to do. After about 30 minutes you'll feel like a pro tossing down buildings and waiting for them to upgrade, but there is also a much larger, deeper metagame waiting to be played, where city design, location, buildouts and rivalries take place. I've been playing this game for over 3 months now, and I'm still learning new things quite often. This was probably the biggest surprise for me...the fact that a f2p browser-based game could have the level of depth that I've found in LoU! Because of it's PvP aspect and dependence on alliances (guilds) this game is much more dynamic than I expected it to be. There are many different elements of the game, each with their own mechanics. At the end of the day this game isn't much more than a calculator with pictures. From the city-building perspective you can queue up new buildings and/or building upgrades, which can take anywhere from seconds to days to complete (building speed can be increased by a HUGE margin by building cottages), but your goal is to create maximum synergy between the buildings based on your city layout. There are all sorts of websites and city-builder programs to help those that are not familiar with this aspect of the game, but once you understand the formulas it's not very difficult. Travel is pseudo-real-time, where troop movement and trade-good delivery can take hours or days depending on where they're traveling to. Combat is instantaneous based on a rock-paper-scissors methodology, where you will perform your assessments based on your troop size and your enemy's estimated troop strength, then send them out for the attack...you will be told the exact time that the battle will happen, at which point you will receive a report explaining the results and any loot received. There is a nice mix of offensive and defensive troops and structures, each with their own strengths and weaknesses, to give players a nice variety of tactics and strategy. LoU can be played (and enjoyed) without spending a dime, but that doesn't mean you aren't highly incentivized to purchase items. Items are purchased by spending diamonds (diamonds can be purchased for roughly 100 diamonds per $1). The use of items within the game is limited to your mana, which is set at a fixed regeneration rate. The amount of mana you can have, as well as the rate it regenerates, increases as you progress through the game, but they do not sell "mana pots" or anything else to help you gain mana faster. Items that can be purchased include everything from resources to travel speed to city protection (removes the ability for other players to attack your cities) and seems to be relatively well balanced. These same items are also given to each player at the rate of one per day, so you will still receive a small benefit even if you don't purchase any items. Everyone has the same mana/mana regen at equal "ranks" and how/when they spend it is up to them. As with any MMO I've ever played, there are multiple objectives to suit multiple different play-styles. City building enthusiasts will enjoy building the largest empire on the server....People who enjoy PvP will enjoy capturing (or destroying) other castles and reaping the rewards that come with it and (in a content patch promised to be released before the end of the year) PvE players will have a solid (but overly-complex) PvE objective to meet that will enable them to "win" the game. At the end of the day, though, this game is about being efficient...being *more* efficient than the people you're playing against. The people that can generate resources the fastest will be able to recruit more troops and sustain those troops throughout a prolonged battle better than the next guy. -This game is browser-based and highly accessible whenever someone wants to play it. Anyways, I tend to ramble (as I did in this post), so I hope this review achieve my objective, which was to give you a little insight into the game and what to expect from it. I'm addicted to it and that hasn't happened to me and a game in many years. It's simple enough to enjoy without making your brain hurt, it's designed to be played efficiently with minimal time at your computer (leaving you more time to do other activities) and it has enough depth to keep players intrigued enough to continue playing.